We’ve all faced sudden bouts of fatigue and have likely looked to coffee, soda, or energy drinks for a temporary boost to get through a particularly challenging morning, commute, or afternoon slump from time to time. The problem with these temporary solutions is that they are acidifying to the body and very difficult to neutralize. When large amounts of caffeinated beverages are consumed on a regular basis, we are contributing to an underlying cause of fatigue: dehydration. Despite the fact that all beverages have a water content, caffeinated beverages make the body steal alkaline minerals from itself in order to offset the acidity, which is a very draining process. But fortunately there are many natural alternatives to caffeine which can help boost your energy when needed. Ionized alkaline water from an electric water ionizer is supercharged and naturally energizing. Not only will it deliver antioxidants and bioavailable minerals to your cells, but it is microclustered for deeper hydration. Because it is said that the number one cause of the dreaded “afternoon slump” is due to dehydration, this is great news. Tap and bottled waters simply can’t compete with ionized alkaline water because they are acidic on the pH scale and oxidizing to the body. By nourishing your body with filtered ionized alkaline water you are fueling your internal gas tank with the best and most energizing water on the planet. For an added boost, you can try adding a pinch of natural sea salt to your water. Obviously sleep deprivation is a cause of fatigue and damaging to the body. By getting 7-8 hours of sleep a night you are allowing your body to heal and rejuvenate itself. If you feel that you don’t have enough hours in the day to get enough sleep then it is time to re-evaluate your schedule and your priorities. Everyone knows that exercise can be an instant mood and energy booster. Even going for a short walk on your lunch break may be able to rev up your hormones and get your body geared up for tackling the rest of the day. Juicing regularly is one of the healthiest things you can do. It provides your body with an abundance of healthy alkaline minerals and helps offset toxicity and deficiency. Aim to drink at least one fresh made juice or smoothie a day, and focus on getting as many green leafy vegetables and alkaline fruits like avocado and lemon in it as possible. Avoid using overly sugary fruits like pineapple and banana, which can cause a spike in blood sugar and defeat the purpose of healthy juicing and smoothie making. Nuts and seeds are great healthy alkaline snacks that provide an energy boost. We recommend pre-soaking them overnight for easier digestion and then carrying a small bag of them around with you. Raw veggies are also a great alkaline snack choice that can keep you energized. And eating only until full allows your body not to be overburdened and thus to have more energy to spare. 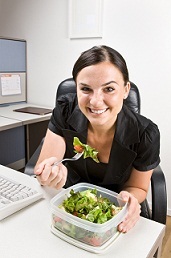 It’s no secret that heavy or fried foods like pasta and French fries can zap your energy instead of providing energy. By choosing salads or other alkaline, raw foods instead of unhealthy and acidic foods you are providing your body with an healthy energy source instead of an energy drain. By implementing any or all of these natural solutions, you won’t have to worry about grabbing an unhealthy beverage to combat an afternoon slump or bleary-eyed commute to work again!